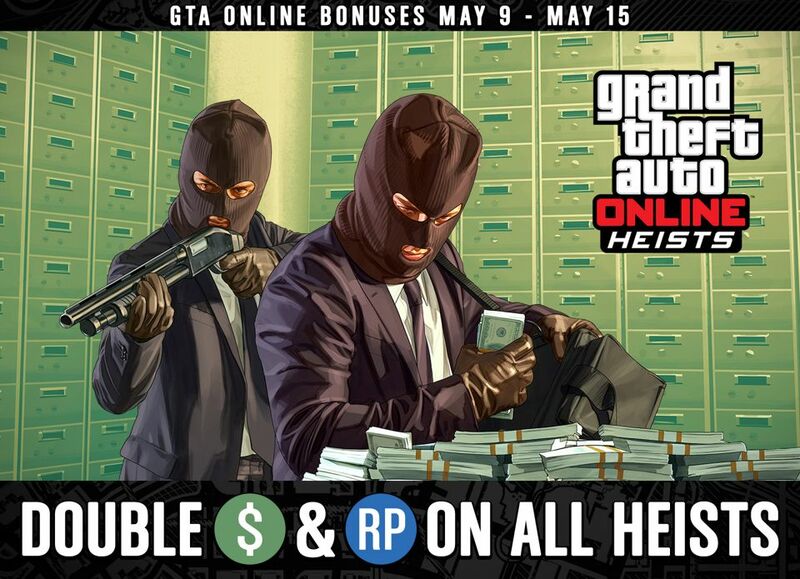 Get doubly rewarded this week for taking down the lucrative scores from GTA Online: Heists, as all five of these multi-tiered cooperative missions will be dishing out twice as much GTA$ and RP from May 9th — 15th. Fleeca Job — Prove your worth as a heist crew by taking down a small Fleeca Bank franchise on the Western Highway. Scope it out, get your getaway car, then take it down and get out clean. Prison Break — Break a high value inmate out of Bolingbroke Penitentiary. To get him out, you’ll need an inmate transport bus and a smugglers’ plane. To keep him happy, you’ll need to settle some debts and get him his car. Humane Labs Raid — Go into a secretive research facility and come out with their data. Get hold of an EMP and get it into their grounds, get the Lab’s key codes, and get yourself an attack chopper. Then half the team hits the lab and half holds off security until it’s done. Series A Funding — Help a smalltime dealer get the stock he needs to launch a bigtime distribution business. Raid some of the largest narco-operations in the state, take their product, and get it all together for the big sale. Pacific Standard Job — Bring down the flagship branch of one of the biggest banks in the country. Find a transponder and tune it to the right signal to disable Pacific Standard dye packs, get hacking equipment, getaway bikes and thermal charges, then go in hard and come out with their holdings. While being in a Crew isn’t a necessity for Heists, communication and coordination are key to maximize pulling off a successful Heist with your jewels intact. So round up your best Crewmates and put that planning board in your luxury apartment to good use. If you’re looking to squad up with some like-minded entrepreneurs, check out some recently featured Crews recruiting here on the Newswire or head over to Social Club to scout out potential partners-in-crime. Don’t forget to take full advantage of all the other discounts and bonuses currently active in GTA Online, from Double GTA$ & RP on Biker Contract Missions to bonus payouts on Special Cargo Deliveries, 25% off select Vehicles and more. Get the full rundown at the Social Club Events Page. This week’s Premium Special Vehicle Race is “Beach Party” — locked to the Blazer Aqua. Launch Premium Races through the Quick Job App on your in-game phone or via the yellow corona at Legion Square for a shot at big GTA$ payouts awarded to the top three finishers, and get Triple RP just for participating. “Raton Canyon” is this week’s Time Trial. Set a Waypoint to the marker on your map and enter via the purple corona. Beat par time to earn a sizable GTA$ & RP reward.